The standard cartridge pack for the unit is our part number FC998. It contains all three cartridges needed. Turn off the inlet water. This is done with the blue-handled inlet valve in the black tube that goes to the pressure regulator valve on top of the unit. Next, turn off the blue handled valve on the top of the storage tank. Open the ledge faucet and leave it open while you service the unit. If no water is coming out of the open faucet, you know you have the water off and it's safe to open the filter canisters. Black Housing, Center: MatriKX Pb1 Carbon Block Cartridge for chlorine/chloramine reduction, chemical reduction, lead removal and cyst removal. Our part number is FC004. Blue Housing, Left: AAL, fluoride removal cartridge. Our part number is FC011. 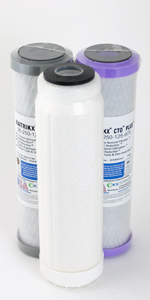 Blue Housing, Right: MatriKX CTO+ Carbon Block Filter for high chemical, chlorine/chloramine removal. Our part number is FC001. After the cartridges are replaced, open the blue-handled valve on top of the storage tank. The faucet should still be open. Water will flow from the tank and eventually come out of the faucet. Let it run until it stops. Lift the tank to feel its weight. The tank should now be empty, but it may still have some water in it. If water remains in the tank, it means that the tank needs air. To air the tank, attach a bicycle pump to the air valve on the side of the tank and slowly pump air into the tank. Be sure that the faucet is still locked open. The air added to the tank will drive any remaining water out of the storage tank. When the tank is empty, leave about 7 pounds of air in the tank (you'll need a low pressure gauge to measure this). If you have more than 7 pounds of air in the tank, let some out. Too much air will limit the amount of water the tank can hold. When the tank has been emptied of water and aired (or if you determine that that tank does not need air), turn on the inlet water to the unit with the blue-handled valve. Leave the ledge faucet locked open. After a short time, water will begin to run in a small stream from the open faucet. Let it dribble out of the open faucet for at least 15 minutes, then close the faucet and let the tank fill. This should take just a few minutes. When the tank seems full, lock the faucet open and let the tank empty completely until the faucet returns to the small stream that you saw earlier. Close the faucet and repeat this step, letting the tank fill completely, then empty. Close the faucet and let the tank fill. You can start using the water at this time. If servicing the unit seems like a complicated process, it's really simpler than you think. Do not hesitate to call us if there is a problem or if you have a question.